By Dr. Matthias Rath, M.D. Ty Bollinger: So could you kind of reiterate these micronutrients that cause cancer—they stop cancer cell growth, they stop the spreading, they stop the blood vessels, the growth of new blood vessels, the angiogenesis, and that also cause the apoptosis, the programmed cell death? What are these nutrients that have the synergistic effect, like the orchestra? What are the components of this? Dr. Niedzwiecki: Yeah. This is vitamin C. For simple reasons, since we are targeting the stability and integrity of connective tissue. Without vitamin C, connective tissue cannot be produced. The other compounds of this synergy – very powerful component – is the amino acid lysine. Lysine is an inhibitor of those collagen digestive enzymes, but also lysine is a component of collagen. One third of amino acids in collagen are lysine and proline. So it is important that they are included. And lysine, similarly to vitamin C, is not produced in our body. It only comes from the diet. We are also having other components like N-Acetylcystine. We are having trace elements including copper, selenium. And we are having the active component from green tea, called apigallocatechin gallate, or EGCG for short. And quercetin. So this is the mixture of several components. You can find the information on our website. And this is what—we tested them, we tested individual compounds and also we combined them in the synergy. So they are components acting on different mechanisms in our body, including—what we see they also have an anti-inflammatory effect. And what we know from one side, inflammation is associated with cancer, and also long-lasting inflammation is the triggering factor for developing cancer. And these micronutrients are also effective in addressing this important aspect. So this is this pleiotropic effect of micronutrient synergy that we are working with. Dr. Rath: When we had the first proof of the concept that actually micronutrients are the solution to the cancer epidemic, we were thinking about how to present this to the public at large. We decided to go into USA Today, in 2002, in March. The largest circulation newspaper at the time. They didn’t want to publish. So we said, “Well, but we just presented this information at the Breast Cancer Conference in Miami, Florida, so why shouldn’t you publish things that are there in the scientific community?” So finally they did. It was a whole page, “Breakthrough in the Natural Control of Cancer,” and listing some of the micronutrients: vitamin C, lysine, proline, and showing some of the research, all in layman’s terms. That did it. It triggered the war against this breakthrough that I just mentioned before, with more than 100 lawsuits, mostly focusing on cancer. 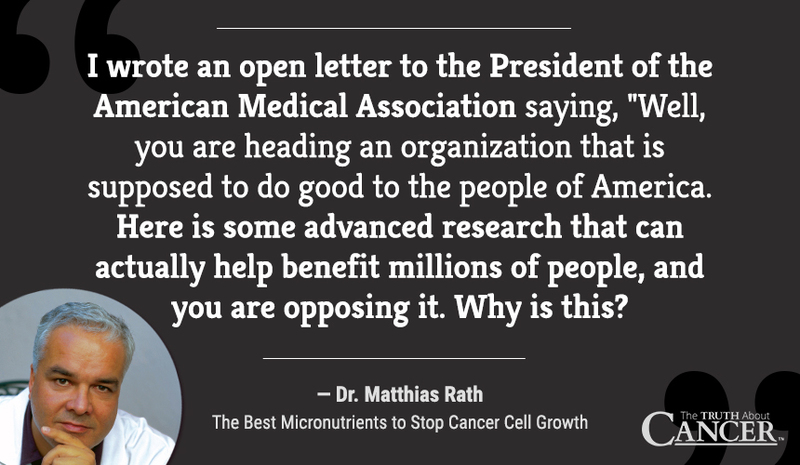 The American Medical Association gave a media alert about Dr. Rath and his research institute. That no media should be publishing anything about our results. I thought, how could you deal with such an unethical approach? And I printed his email address at the bottom, and encouraged the readers to send their comments to the President of the AMA. We’ve never heard anything about them, so we assume that he got a lot of mails. I’m telling this not to brag about this battle and some lies episodes. It tells again, that it is extremely important to state the truth, to fight for the truth, and this is why we appreciate you coming to us and interviewing us at length on this process. Because it is a courageous thing that you are doing, Ty, and not just with us. But with opening up this curtain of deception and lies about cancer and for a lot of diseases. And giving the people of America and the world a chance to see through that maze of deception, and make their own choice. I think you must be complimented. I’m complimenting you for that. Dr. Niedzwiecki: Yeah. Because now, I think it’s even more difficult in fighting for scientific proof, truth, because in old days, before pharmaceutical industry was created, it was more convincing others to accept the concept. So this was mostly fighting somebody’s egos and careers. But now, we are challenging the most powerful industry on Earth. So this is not accepting science. We see from our other contacts, that many doctors, scientists agree with what we are doing and what we are publishing. But there is an economic aspect, and economic pressure, which is very difficult to overcome. And it is only by education, by spreading information and knowledge to people, this is how we can change it. About Dr. Matthias Rath, M.D. 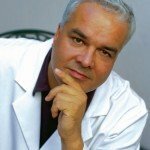 Dr. Rath was born in Stuttgart, Germany, in 1955. After graduating from medical school he worked as a physician and researcher at the University Clinic of Hamburg, Germany and the German Heart Center in Berlin. His research focused on the causes of arteriosclerosis and cardiovascular disease. Today Dr. Rath heads a research and development institute in nutritional and Cellular Medicine, in which Dr. Niedzwiecki functions as the head of research. His institute is conducting basic research and clinical studies to scientifically document the health benefits of micronutrients in fighting a multitude of diseases. Dr. Rath is a member of the New York Academy of Sciences, the American Heart Association and other scientific organizations. His popular science books “Why Animals Don’t get Heart Attacks – but People Do” and “Cancer” have sold several million copies in ten languages.